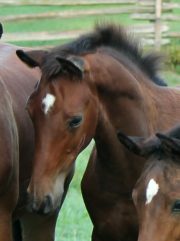 A strapping bay colt from Chenya (her 1st ever colt – she is a filly producer), with white points, a star and a snip. A sweet, friendly fellow, athletic and graceful with an uphill build. Le Boheme (“Bo”) boasts an interesting pedigree. His sire, Buckingham, was winner of his Stallion Performance Test with a breeding value of 154 for dressage. His three fantastic basic gaits and his constant willingness to perform were rated with outstanding scores, and the test riders were absolutely delighted: he got a 9.5 for his rideability. 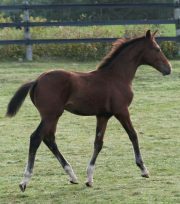 Buckingham brings the Dutch performance genes of Bordeaux and Rousseau to this fine foal. 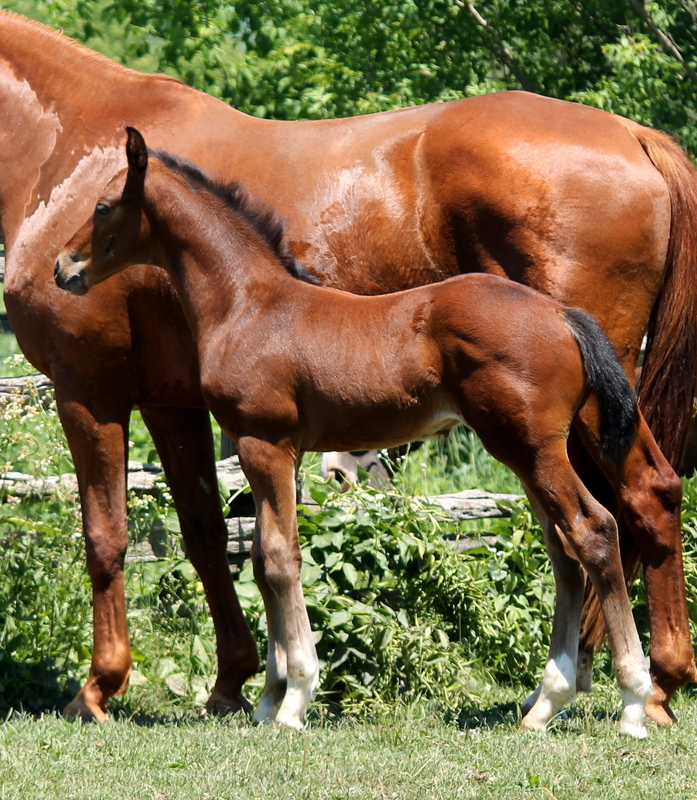 Dam EM Chenya is sired by the beautiful Contucci, from a Bordeaux (Bolero son) / Weltmeyer dam. 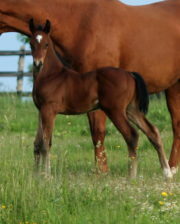 Chenya is full sister to the USA dressage champion Cabana Boy. Chenya has ben a great producer, with Champion Foals and MPT Champion, and Elite Mare daughters. Chenya’s 2017 filly by Furstenball was awarded the honour of “Top Ten Hanoverian Foal, 2017”. 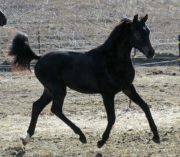 SOLD including full board, farrier and worming, until weaned, Plus registration / branding with the Hanoverian Verband. Video shows barnyard footage at 1 week of age, at almost 4 weeks of age, and again at 3 and 3 1/2 months old. Pictures are from birth to about 3 months old; followed by a picture of Bo’s 1/2 sister, from 2017; and his Sire Buckingham.